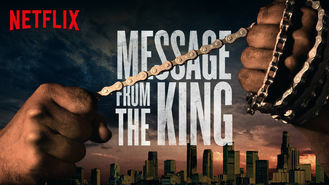 Message from the King (2017) on Netflix Canada. Check worldwide Netflix availability! If Message from the King isn't available in your country, or you are visiting a country where it isn't, there is still a way to watch it! On a relentless quest to avenge his sister's murder, a man from Cape Town infiltrates a sprawling network of lowlifes and elites in Los Angeles. He's new in town but no stranger to violence. A furious outsider seeks vengeance in LA's criminal underworld.